21 September 2007 (Science Magazine) – And finally, the abstract of the homo floresiensis wrist study from Science Magazine. Subscription required for full access. 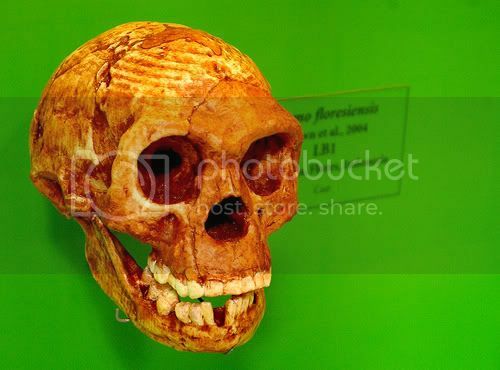 Whether the Late Pleistocene hominin fossils from Flores, Indonesia, represent a new species, Homo floresiensis, or pathological modern humans has been debated. Analysis of three wrist bones from the holotype specimen (LB1) shows that it retains wrist morphology that is primitive for the African ape-human clade. In contrast, Neandertals and modern humans share derived wrist morphology that forms during embryogenesis, which diminishes the probability that pathology could result in the normal primitive state. This evidence indicates that LB1 is not a modern human with an undiagnosed pathology or growth defect; rather, it represents a species descended from a hominin ancestor that branched off before the origin of the clade that includes modern humans, Neandertals, and their last common ancestor. 20 September 2007 (Smithsonian Institution) – A new study on the wrist bones recovered from the homo floresiensis assembly adds extra weight to our Hobbit from Flores being an entirely new species rather than a sick, deformed human. There are a few other stories popping up today so stay tuned for more insights! It’s a really busy day at work, so hopefully I can post them all up by the end of the day. An international team of researchers led by the Smithsonian Institution has completed a new study on Homo floresiensis, commonly referred to as the “hobbit,” a 3-foot-tall, 18,000-year-old hominin skeleton, discovered four years ago on the Indonesian island of Flores. This study offers one of the most striking confirmations of the original interpretation of the hobbit as an island remnant of one of the oldest human migrations to Asia. The research is being published in the Sept. 21 issue of Science.